In a beautiful Parisian-style building, the hotel Le Rocroy Paris offers you personalized quality service to ensure you fully enjoy your stay. Just around the corner from rue Maubeuge, a tranquil residential street with shops as well, Le Rocroy Hotel Paris will allow you immediate immersion into the 10th arrondissement. Situated between Gare du Nord and Gare de l’Est, the legendary Montmartre district is nearby. You can climb the stairs to Sacré-Cœur, have a coffee facing the butte Montmartre and have your portrait done at the place du Tertre. Discover the vibrant Paris of rue de Martyrs or by strolling along the Quais de Jemmapes. In the evening stop off at the Canal Saint Martin and enjoy an authentic Parisian scene. The Rocroy Hotel Paris offers 54 modern, air-conditioned and well-equipped rooms: private bathroom with hairdryer, LCD satellite TV and Canal+ channels, safe, free Wi-Fi access, desk and hospitality tray. The triple rooms are equipped with a double bed and a single bed or 3 single beds. 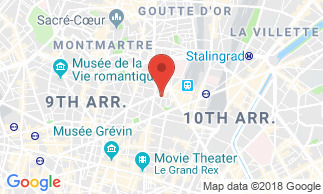 The Rocroy Hotel Paris is located in the 10th arrondissement of Paris, less than a 5-minute walk from Gare du Nord train station with Eurostar and Thalys trains. The legendary Montmartre district and the Sacré-Coeur Basilica are in the immediate vicinity. Parisian breakfast is not included in the room rate : 12 EUR per person.